Geoff de Ruiter founded Democracy Link, an app designed to let its users send direct messages to their local politicians. Photo courtesy of Geoff de Ruiter. Geoff de Ruiter founded Democracy Link, an app designed to let its users send direct messages to their local politicians. Screenshot of Democracy Link. 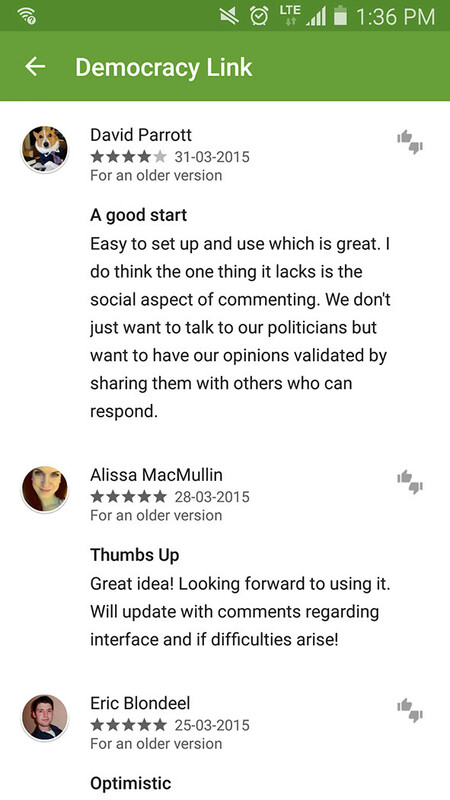 A user on Google Play Store website offers his opinion of the app. Photo screenshot of Google Play Store. There is a problem in Canada with politics and apathy. In the last Federal Election, only 61 percent of Canadians turned up at the polls to vote, and many readers probably had trouble answering the questions above. I know I did. Geoff de Ruiter is a student just like you. One day while reading through articles on the National Post’s website and watching how engaged people were with something as trivial as the comments section, he had an idea. What if it was just as easy to type a message to your local politician as it is to reply to BigBadJoe56? Soon after, an application called Democracy Link was born. 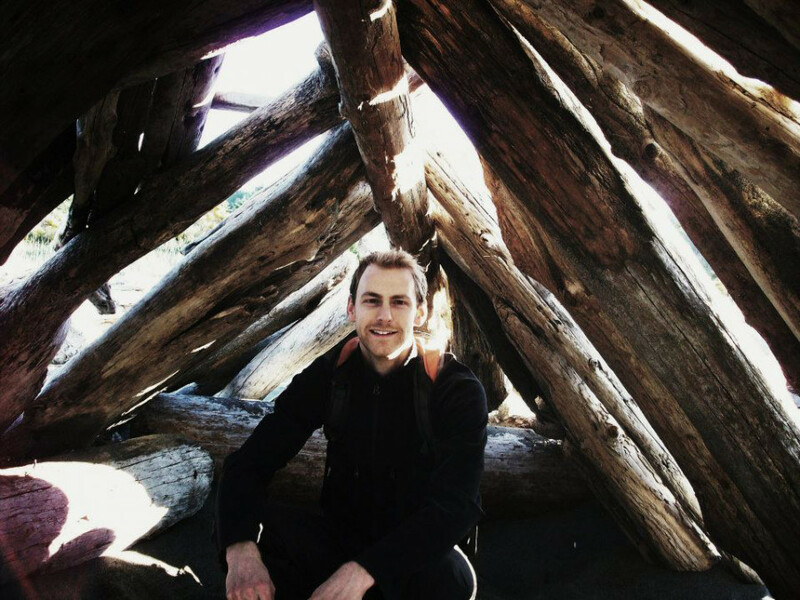 Taking the idea and turning it into something tangible, de Ruiter hired two University of Northern British Columbia developers Devin Calado and Ben Armstrong out of his own pocket. “Politicians want to connect to their electorate — they just tend to not be influenced by those who don’t speak to them so we need to help increase the communication between them and this app will help do that in the way that’s meaningful,” de Ruiter said. Because of the inherent nature of topics like this, he designed the app to be as transparent as possible. When you install the app, it asks for only the most basic of phone permissions to run. Compare that to Facebook Messenger which has the authority to turn the mic on your phone and theoretically eavesdrop on your conversations. After filling in some information about who you are, the app helps you search both your federal and provincial representative through a drop down menu. It also features an input menu that allows you to find and fill out your local and municipal representatives. Once all the sections have been made, the application’s home screen becomes a simple panel with two main options for each level of government — ‘email’ or ‘call’. Day or night, anyone in Canada can simply pick up their phone and, within seconds, voice their opinion to the elected officials who won because of their constituents. Upon testing the app, I found its simple menu easy to navigate and use, but the most important aspect is that it works and messages can be more easily relayed. All in all, the total time between installation and having my MP, Ron Cannan’s phone ringing, was two minutes — that includes playing around with the interface a bit. I left a message on Ron’s voicemail and have yet to hear back from him. Maybe forcing MP’s to return calls can be implemented in the future. “The app is an app for the underdog, it is an app that will help empower those who feel disempowered, who feel that their elected representative isn’t listening to them and for them to get over that barrier of disempowerment,” said de Ruiter. Democracy Link is a new entry in the field of civil engagement applications such as ‘Congress’ in the U.S., which communicates information and contact between American citizens and their congressional representatives. Here in Canada, Democracy Link is the first of its kind, and de Ruiter hopes people will soon use this direct line of communication rather than just post rants on social media. “A person commenting on Facebook, a person tweeting a politician is held to a much lower regard than a letter or email with accountable information at the bottom,” de Ruiter added. But David Parrot, who reviewed the app, had a different perspective. While the app does everything it can to connect you to your rep, the words you use are your own. Each representative is just a name with some contact details. Whether Conservative, Liberal or even Marxist, the app allows for everyone’s voice to be heard equally.